How social is our new Director of Digital Engagement? 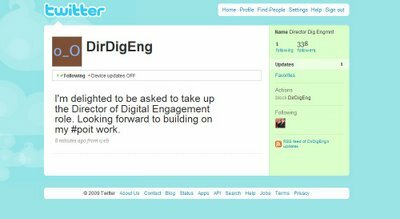 Within those five hours the new Director of Digital Engagement (or one of his minions) failed to follow anyone except his boss, failed to include a photo, and then included a hash tag that few people would have recognised. Obviously the post is more than just being able to use Twitter, but his first comment nicely illustrates the fact that they were more interested in having a good civil servant than a good social media person.